Happy 25th Anniversary American Patchwork & Quilting Magazine!!! 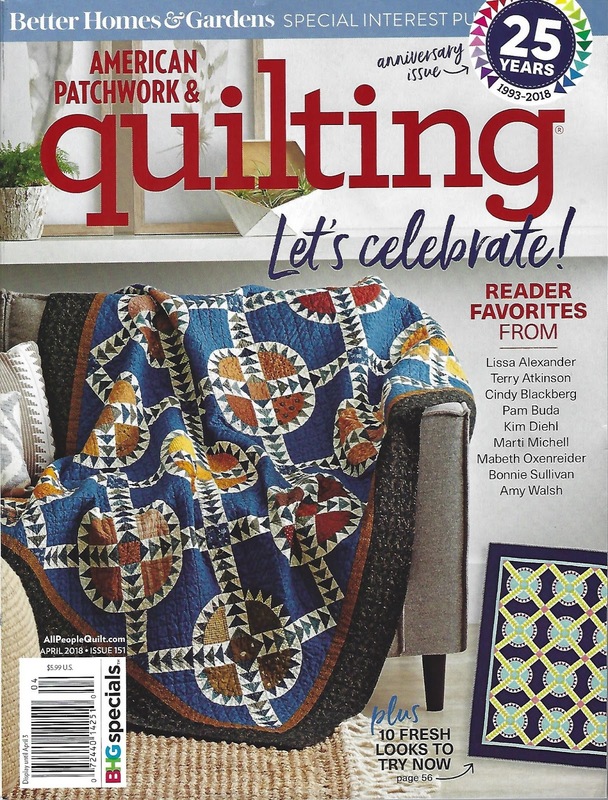 American Patchwork & Quilting magazine marks quite a milestone in April, celebrating their 25th anniversary!! WOW!! You may have noticed the celebration already began with the February issue and will continue all through out the year. The April issue is the anniversary issue, and I am so excited to be a part of it! 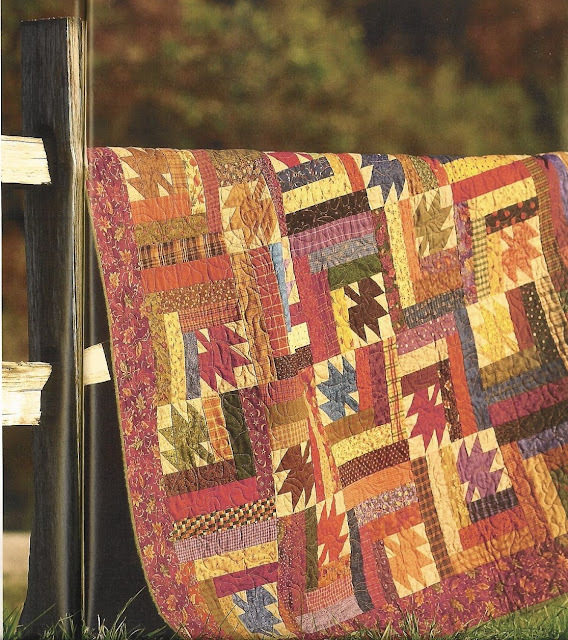 The magazine editors did some research to find the top ten readers' favorite covers in the entire 25 year history of the magazine, and one of my quilts made it in the top ten!! Holy Cow! My Scattered Leaves quilt is a reader favorite. My goodness...I am so jazzed and humbled by this. The quilt remains one of my all-time favorites as well. To have been chosen by my fellow quilters means so very much to me. All designers who's work I greatly admire. 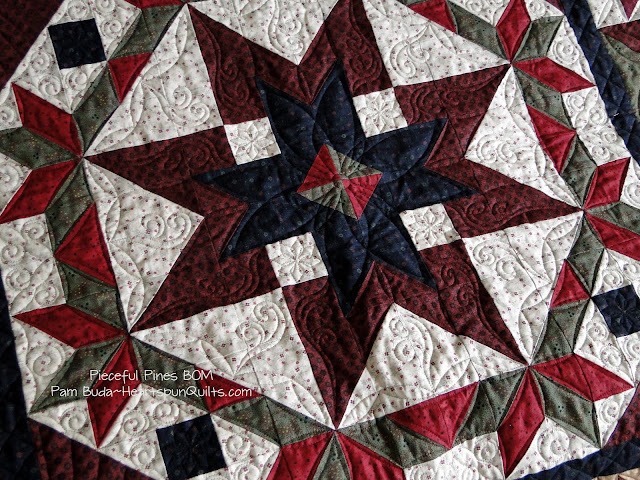 In this special anniversary issue, you'll find the patterns for all ten of the top selling quilt cover designs as well as a Q&A from all the designers. There's some very fun nostalgia from the first years of the magazine, and all the regular columns you love. I have been a subscriber to APQ since I first learned to piece back in 1997. I have many, many issues I've saved over the years of favorite quilts and educational articles. Not to mention I have every Quilt Sampler magazine except for the very first one!! 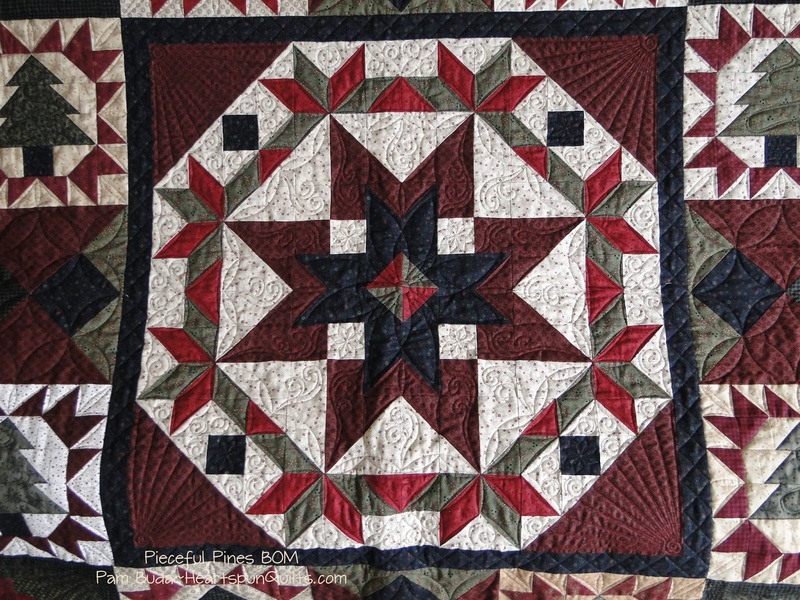 The magazine always strives to bring its readers a beautiful array of quilt designs for every taste, fun columns with new gadgets and notions, quilting tips from readers, and the latest books, patterns and fabrics. There are plenty of educational how-to articles as well. On a personal note....I have been very fortunate to work with the staff at APQ for over a decade now. Heidi Kaisand gave me my first break for which I owe her a great debt (and she'll hear nothing of it! ), and I've been invited to the corporate offices of the magazine in Des Moines, IA several times which allowed me to meet nearly everyone who works at APQ. You might say I am biased, but everyone will honestly agree that they are truly a great group of women...creative and talented...YES! But also the nicest people ever!! From the first moment you begin to work with them, that make you feel that you're a part of the APQ family. The April anniversary issue is coming in your mailbox, to your local quilt shop and newsstand very soon! Please...make sure you get a copy of this very special issue. You'll really enjoy it!! 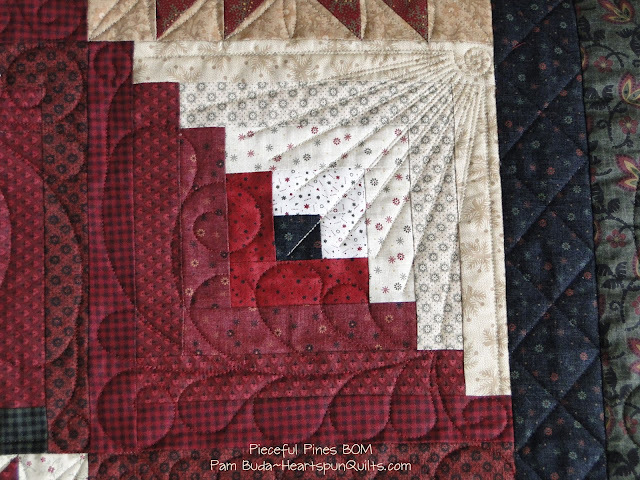 My little Valentine quilt sure has motivated me to display a few red & light quilts to decorate the house. A few vignettes here and there are plenty to make a cheerful Valentine display. 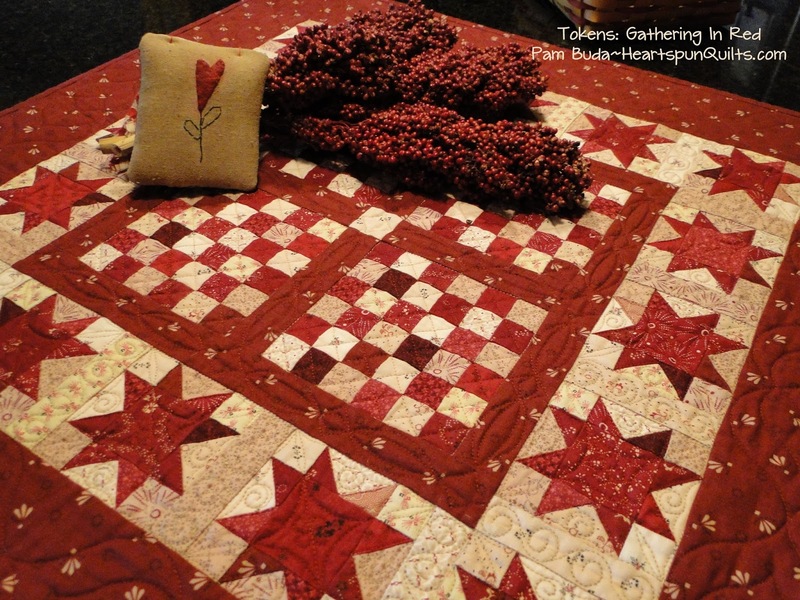 Red and light quilts are so versatile! They are perfect for so many holidays: Valentine's Day, Memorial Day through July 4th, and are so gorgeous with Christmas displays. The quilts above are two of the three quilts included in my Tokens of the Past: Gathering In Red pattern. 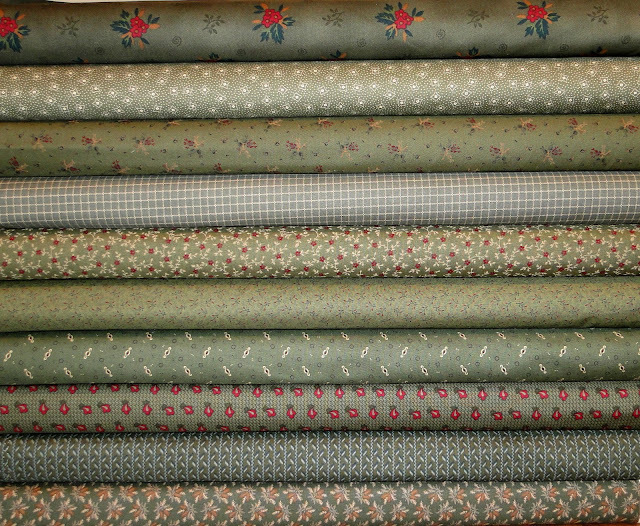 And...I have just a few kits left with all original fabrics to make all three quilts....and....it's on SALE! Loris is the winner of a Valentine kit! She commented: Morning is my go to time for sewing as well although I have recently found some time after the afternoon dog walk before dinner! That early morning before the world gets up is the best time of day though! I had such fun reading your comments. I'd say about half of you said you are able to make time for some sewing nearly everyday. The other half have many things that take up your time...like those pesty but necessary jobs, or caring for children or elderly parents, or a myriad of other things that fall under the label of "Life gets in the way." We all know that feeling! No matter what the situation, we all have things in common. That is the thread that binds us! 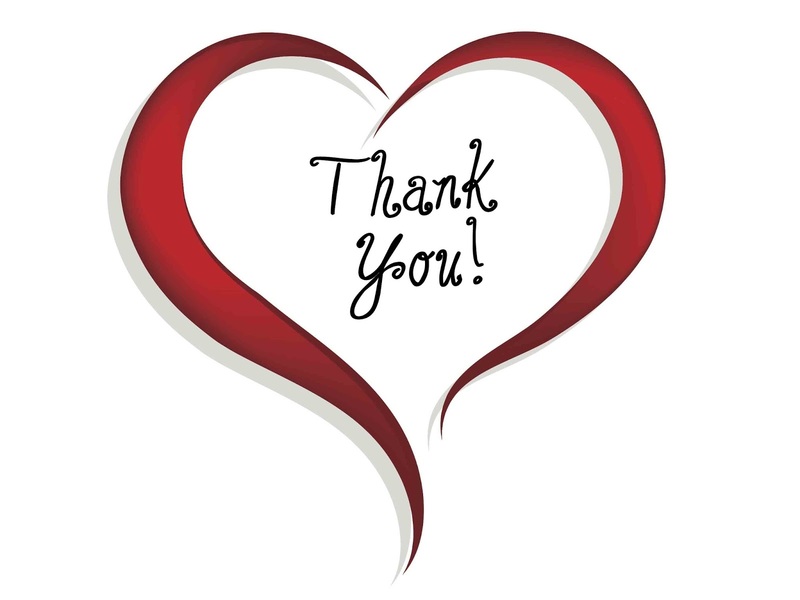 Thank you all so very much for taking the time to not only read my blog, but to comment. Means so much to me. Enjoy your weekend and hope you find some time for some soul stitches...you know...the kind that feed your soul and make you happy! Many, many thanks to all of you who placed an order over the weekend. 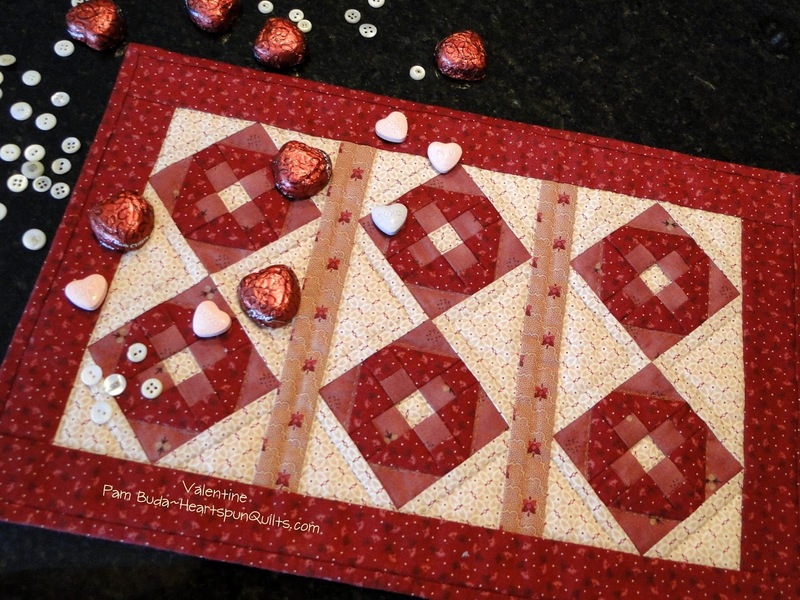 My little Valentine quilt kit was a big hit and I'm so jazzed that you like it!! We're working hard to process all the orders and get them out to you. Please give us a few days to get through them all. I assure you, they will all be going out this week. Snow fell again here last night after a couple of days of warm weather. It was a nice break from the bitter cold. But....Mother Nature is reminding us that winter has a long way to go yet! For the last few months, I've been getting up very early to sew an hour every morning on a very big secret project. Trying to squeeze it in each day while I work on all the other goodies in production. It is a great way to start my day and I am amazed how much I get done in just one hour. Because it's so early, the house is quiet, no phones, no interruptions. It makes me feel so good starting the day with sewing time that I don't know why I haven't been doing this all along! I've got a feeling I'll always make time for at least an hour of sewing each day from now on. Do you dedicate time each day to sew at least a little something? Leave me a comment on my blog by Friday night to win a Valentine kit!! A little "Me" time sewing each day.....It's a very good thing! Valentine quilt ~ FREE with qualifying purchase! Remember the poll I had on my blog about a month ago? 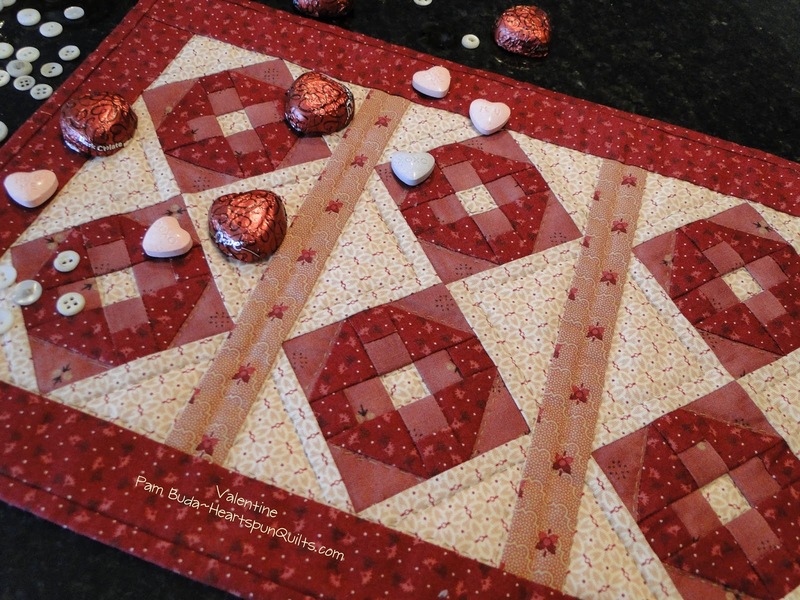 Valentine quilts were at the bottom of the list, so.....I thought I would design one. Your candy dish needs a little quilt to make a cute vignette! This sweet little Valentine quilt pattern/kit may just be coming to your home absolutely FREE!! 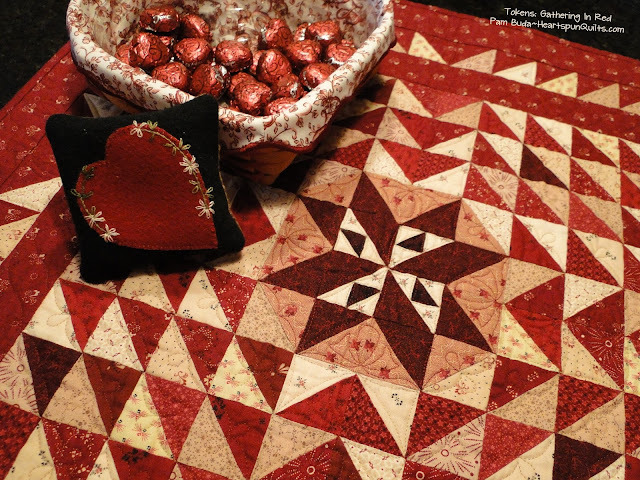 Valentine quilt size approx 9" x 14"
* Place an on-line order for at least $15 to receive the pattern FREE! * Place an on-line order for at least $35 or more and receive the pattern AND fabric kit FREE!! ~ Qualifying orders placed Friday, January 19th through Sunday, January 21st are eligible. ~ Your freebie will be added to your order when we package it up. 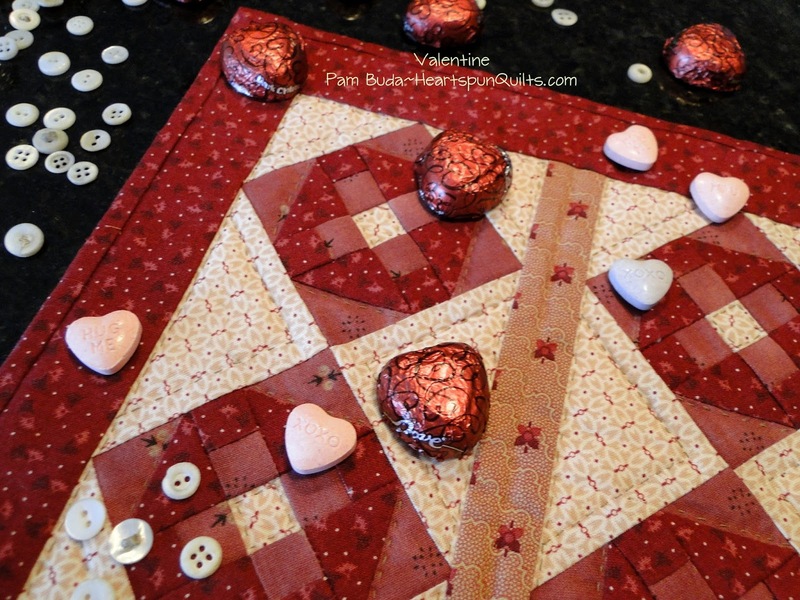 The Valentine quilt is not found on my website so don't worry about having to place it in the shopping cart. There are lots of new things on my website to order!! 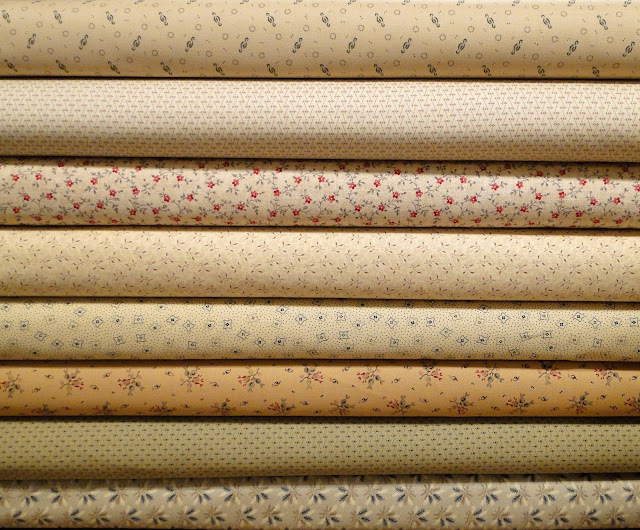 My brand new fabric collection....Tall Grass....is now on the website. 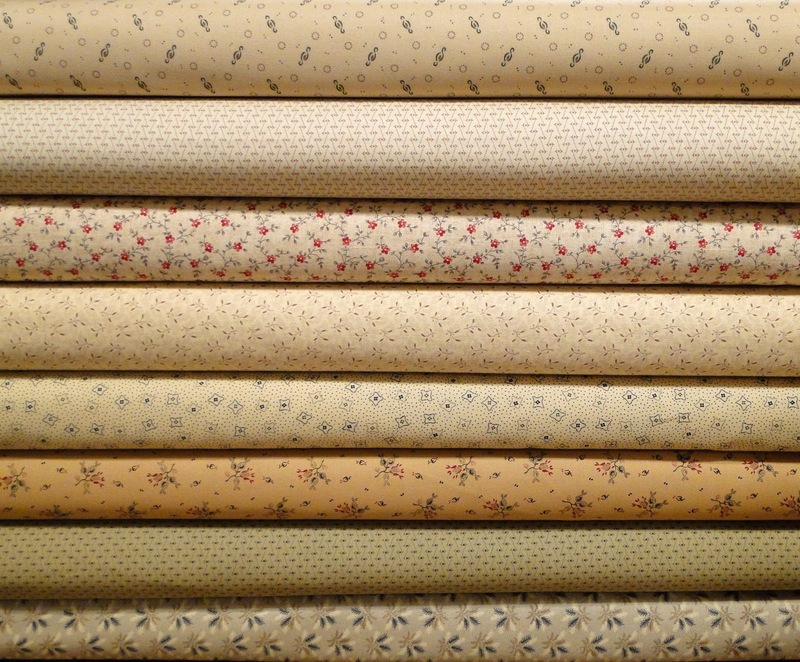 Fat Quarter bundles are ready to go!! 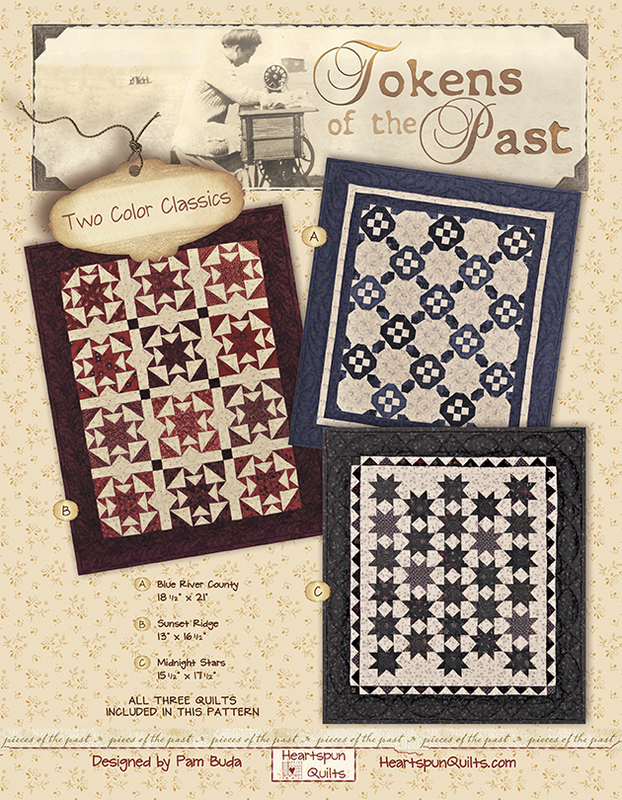 I have re-stocked kits for all three of the Tokens of the Past: Two Color Classics quilts! 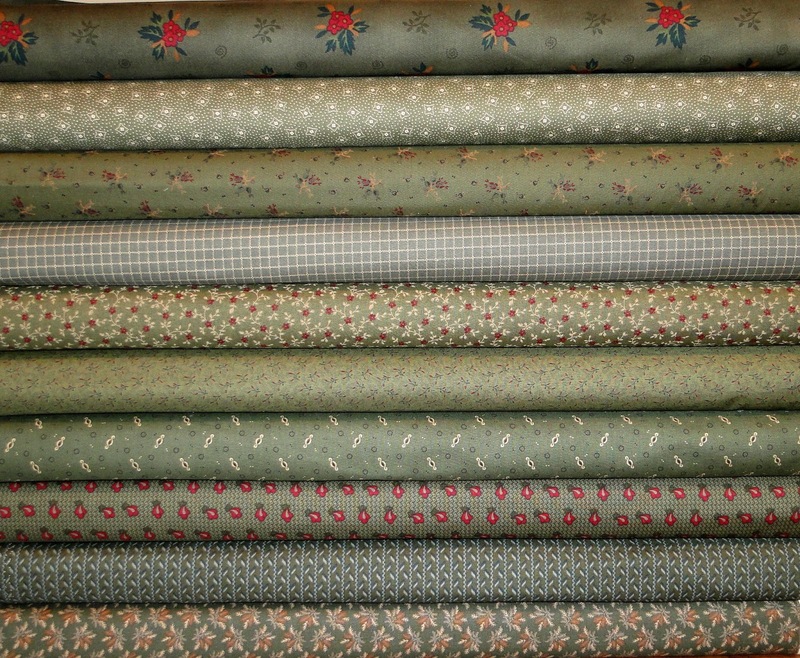 There are loads of patterns, fabric bundles and fabric by the yard. Check out the notions section, too. Bloc-Loc rulers are in stock along with many more very useful items! You can piece this little quilt and have it ready to enjoy on Valentine's Day! 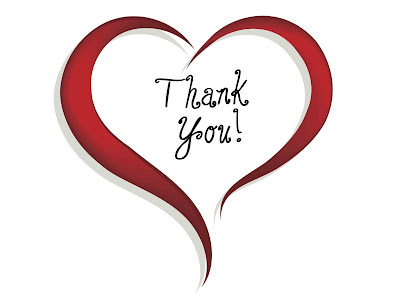 Thank you for your continued support of my quilt designs, patterns and fabrics. You make it possible for me to continue doing what I love and I appreciate it more than you know. 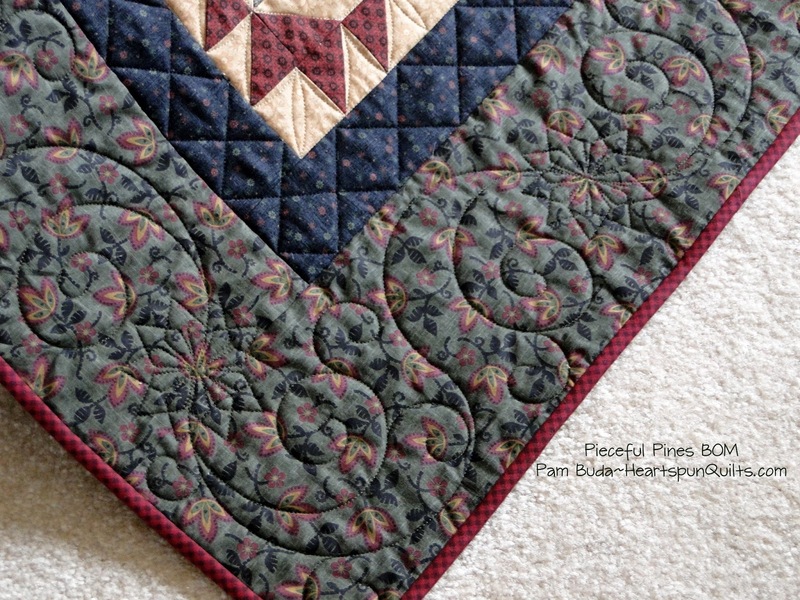 Click here to browse Heartspun Quilts! It's a snowy day here in suburban Chicago and the clouds make for a good day to photograph the quilting of my Pieceful Pines quilt. 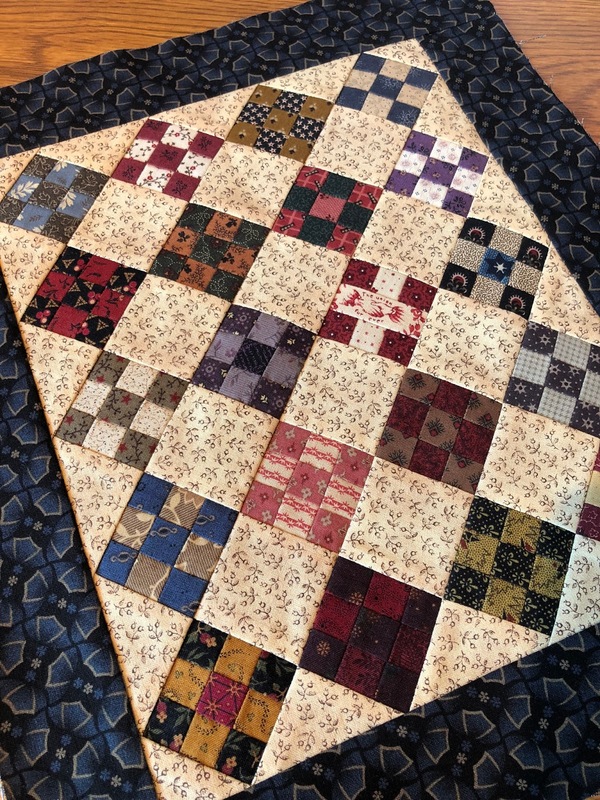 While the dim lighting is great for capturing the quilting details, keep in mind it makes the fabrics look much darker than they are. 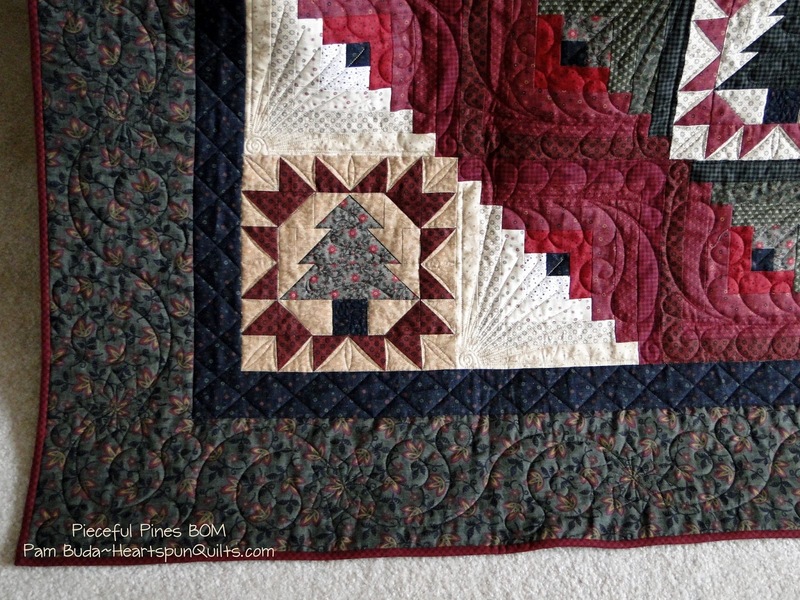 Pieceful Pines is not your usual Christmas quilt in that I chose and designed fabrics that still look historic, not full of Christmas-y motifs. So, when my quilter and dear friend, Ronda and I were searching for quilting designs, I didn't want a lot of Christmas quilting designs either. Ronda found lots of really cool designs. I love feathers which look awesome in the red part of the Log Cabin blocks, and really love the spray design she chose for the other half. I think the straight lines give nice juxtaposition to the soft rounds of the feathers....and it kinda reminds me of gingerbread molding. This little design reminded me of two things....a snowflake and the Spirograph I used to play with as a kid! It isn't overly Christmas-y and fits in nicely....I think. 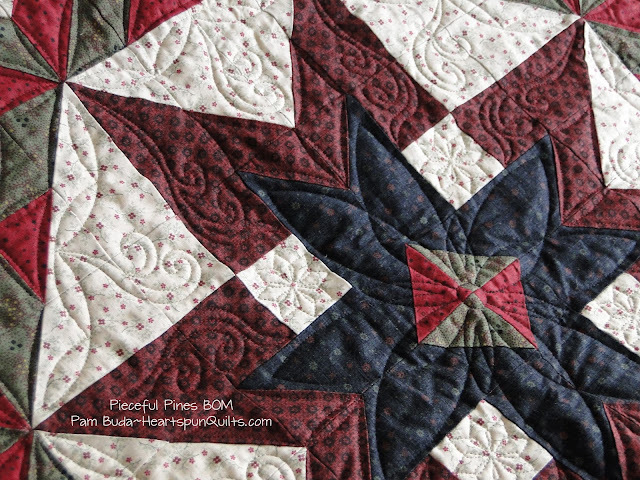 The center wreath and star blocks have some other gorgeous designs. I love this center. It would make an awesome table topper centerpiece all by itself. I hope sharing our quilting designs will help you with ideas when your Pieceful Pines BOM is completed. 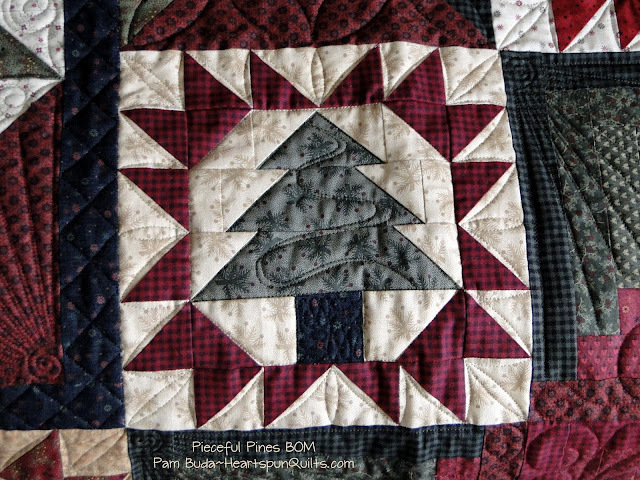 Pieceful Pines begins in April and will end in November, just in time for next Christmas!! 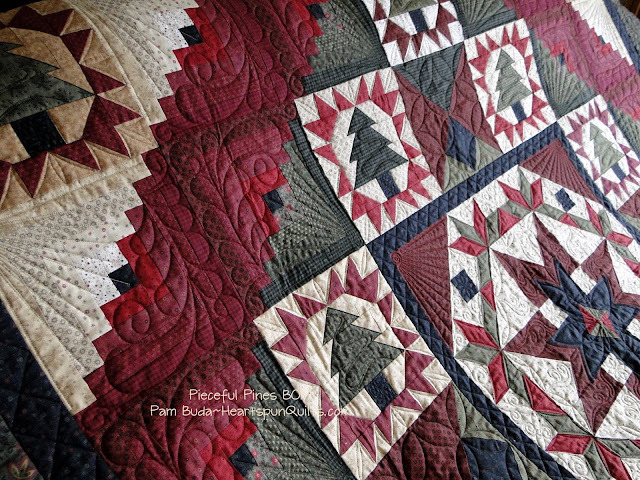 Please ask for Pieceful Pines at your local quilt shop! A little birdy told me to say you really might like to check my blog on Friday morning. Something special may be coming your way! I seem to be deep into 'design mode' these days and that means I don't have a lot to show you right now. Bummer! But...that means there will be lots to share in the coming months. We've been in the deep freeze here these last few weeks, and with my family, it means warming up over a hearty bowl of soup on those cold wintry days. If you're like me, you enjoy the way the house smells with a cozy pot of soup on the stove. So...I thought I'd share one of my favorite soup concoctions ~ Minestrone! The thing that puts this soup over the edge are tiny meatballs. Oh...they are so yummy!! Making the meatballs are the only real work in this soup. One pot is all that is needed for this soup so there aren't a lot of dishes to clean up either. Win, Win!! I made my meatballs a bit larger than a marble. They will shrink some when cooked and I just want them to fit on the spoon. The rest of the soup ingredients are dumped into the pot. Even the pasta is uncooked when added and cooks in the broth! Sweet!! Garnish the Minestrone with shredded mozzarella cheese. Better yet is the shredded Five Italian Cheese blend from Kraft. That cheese blend is truly awesome!! Hope that warms your tummy! Enjoy. 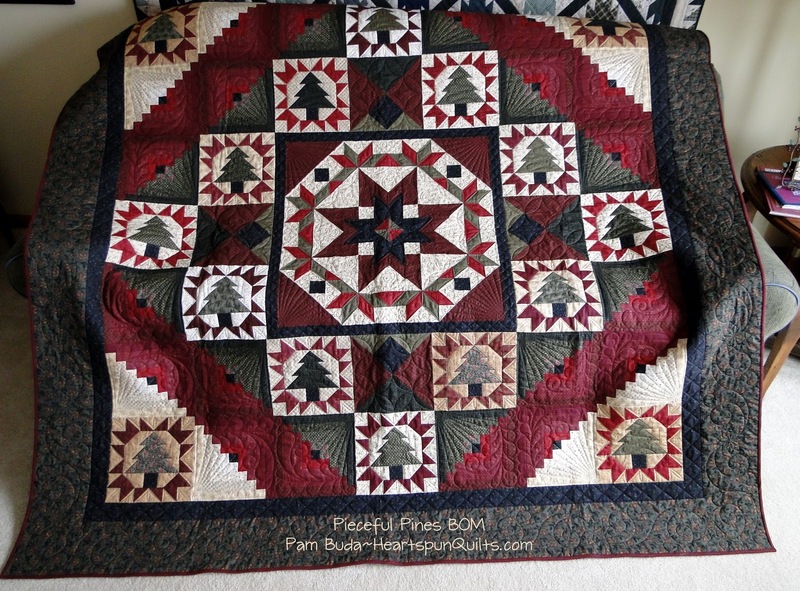 I have my Pieceful Pines quilt back from my quilter friend Ronda now, Oh, the quilting!! I'll have photos of the quilting to share with you next time. Until then....be a friend to your needle and thread. That slower pace also opens up some free time which I took advantage of this past week or so. The little Nine Patch quilt you see has been a work-in-progress (Yes, UFO!) for more than a year. Sad to say but I only needed five more little Nine Patches to complete the quilt as of Christmas 2016!! Sorry to admit that it took a year to make five Nine Patch blocks and choose the setting fabrics and border. I'm betting you have a project or two that is very close to being done, just waiting its turn. New Years Day was quiet here, so I finished this little quilt and I'm so jazzed about it!! I'm thinking a couple of the blocks are too dark now that I can look at it all done, but it's done, so it's staying that way!! In the meantime, I hope life has slowed down a bit for you as well...to relax, enjoy and take it all in. I'm going to prepare a few hand-stitching projects that I can work on in the evenings. And, maybe I'll be able to complete another UFO tomorrow. Now that would be wonderful. I know just the project, too! Another Nine Patch quilt that only need just one applique block and will be ready to complete. Hhmmm.....tempting...very tempting. Hope you find time to do what makes your heart sing! 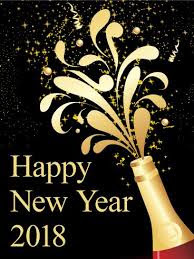 Wishing everyone a blessed and wonderful New Year! May the coming year bring you good health, prosperity and good times with family and friends. I am looking forward to some exciting things happening at Heartspun Quilts, and I sincerely thank you for your support which allows me to continue bringing fun quilty things for your stitching pleasure! May the world be fill with peace, understanding, forgiveness, graciousness, kindness and caring for one another.